Herringbone flooring, which can also be known as parquet block flooring, is one of the most characteristic and recognisable hardwood floors around. The word ‘herringbone’ actually refers to the particular pattern and style that you can make with this flooring. The flooring is self is made from a solid piece of hardwood, which has been manufactured into small blocks of flooring. These block of flooring can be laid out in a number of different patterns, but ‘herringbone’ is the most traditional and by far the most popular. To create your perfect herringbone flooring you can choose a colour (the species of wood) and surface finish to complement your room. Why should I choose solid herringbone flooring? Solid herringbone flooring radiates luxury and character and is one of the most popular patterns created with parquet block flooring. It can easily transform any space into a beautiful and elegant room. If you want a long lasting and durable floor covering that has character and charm, then this could be the floor for you. Herringbone flooring can be found in different species of wood and with different surface finishes. The most popular choice is unfinished Oak herringbone flooring. The surface of the floor will need to be protected with oil or lacquer once it has been installed, but this gives you the opportunity to possibly add a colour stain and then choose your own surface finish, which can help to create a unique and charismatic floor. If you are still not sure about which type and style of flooring is right for your property, have a look at our Wood Flooring Guide. It offers further information on the structure, profile and finish of the different types of hardwood floors. 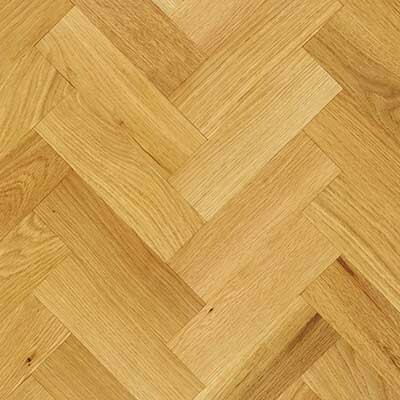 If you would like further information about herringbone or parquet flooring, you may want to take a look at the following article: What is parquet block flooring? Yes. We have an amazing range of flooring accessories in either solid hardwood, aluminium or MDF. There is sure to be something to match or complement your choice of flooring. We have everything from beading and skirting, right through to door ramps and pipe covers. We are sure you will find something to add the finishing touches to your project and complete the final look of your room. We also have a wide range of cleaning and maintenance products. They have all been designed specifically to be used on wooden floors. If you want some tips on how to keep your hardwood floor looking fresh and new, read our Wood Floor Maintenance and Care Guide. Yes, as well as parquet block flooring we also sell the more traditional plank flooring in both engineered and solid wood structures. For any technical advice, support or any questions you may have then please either contact us or come to our showroom where we will be happy to help. If you are interested in having a look at any of our floors in the comfort of your own home, then order your free samples today.